The Scottish Improvement Science Collaborating Centre is funded to strengthen the evidence base for improving the quality of care sustainably and at scale. Our programme of work will generate new knowledge to support improvement activities within health and social care; building capacity and capability through a cross-sectoral platform. Our ground breaking collaborative model brings together expertise in research, improvement and implementation science, practitioners from health and social care settings, policy makers, service users and volunteers. Our engagement and work-streams are supported by the knowledge generation from the research themes. Embedding evaluation within the implementation of the projects within the work-streams will inform the research themes and create new knowledge to support the delivery of improvements in health and social care. Our current projects are active under two workstreams and a platform. 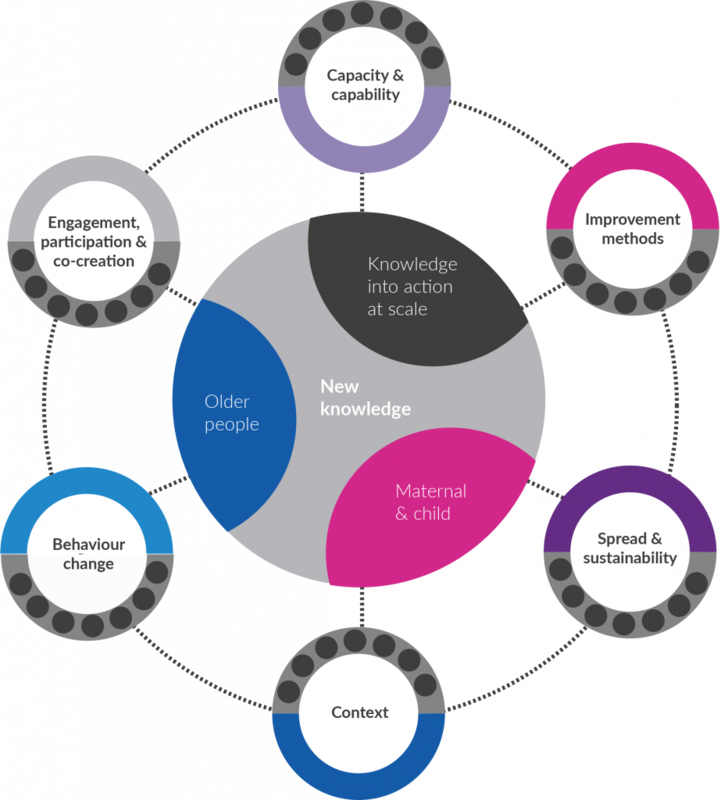 Knowledge into Action at Scale – can large scale education approaches deliver effective and cost-efficient training to improve health and social care? Maternal and Child Health – implementation of evidence-into-practice to improve outcomes for babies and families in neonatal units. Older People’s Health & Wellbeing – Safer prescribing in primary care and benefits for physical activity. SISCC works collaboratively to strengthen the evidence-base for delivery of large scale sustainable improvements in health and social care across Scotland. By promoting the measurement of outcomes through the lens of four domains, we hope to have a positive impact on care delivery in health and social care settings. Launched in June 2015; the Scottish Improvement Science Collaborating Centre is funded by a five-year £3.25 million grant from the Scottish Funding Council, Chief Scientist’s Office, NHS Education for Scotland and the Health Foundation; with substantial additional investments from partner organisations. An additional Health Foundation grant was awarded to deliver knowledge into action at scale programmes and evaluation.